This post was contributed by guest blogger Jack Leeming Editor of Naturejobs, part of Nature magazine. The part of my job I most enjoy is building and telling interesting stories — whether I’m working with a talented journalist to shine light on living as a scientist in Beijing, talking to people about taking beautiful photographs of their studies, reporting on amazing women in science, or asking someone how and why they left academia. Humans are designed to pay attention and enjoy anecdotal forms of information — identifying with a character, building emotional investment and following cause-and-effect relationships are all things almost all of us are programmed to appreciate and understand. We build narratives around the self, too — when talking to friends or dates or colleagues we tell tales about parts of our lives that tend to have a story structure: beginning, end; cause, effect; lesson, learning. Storytelling is a crucial part of interpersonal communication, which makes honing your ability to tell stories a similarly crucial skill for career advancement. Scientists do and should tell stories all the time. They provide accounts of their research struggles in papers. They recount accomplishments in talks and interviews. They even tell short stories during weekly lab meetings. When scientists tell good stories, they engage their readers or listeners thus expanding the impact and appreciation for their research. 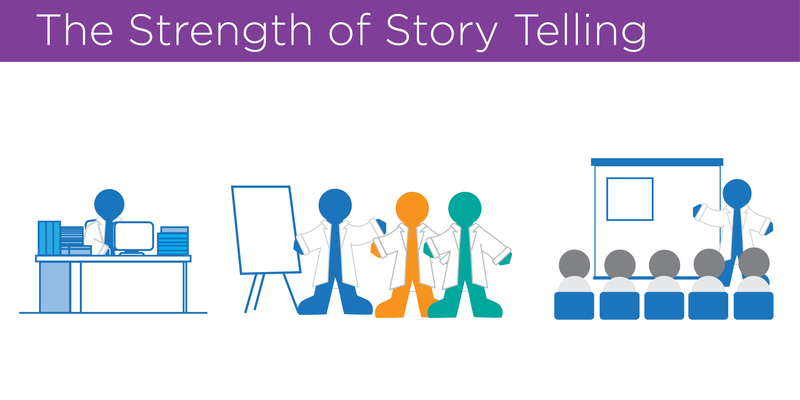 Long story short, telling a good story is something that can be learned, and will serve you well in your career. “I did the most work for a paper we were publishing, but when it came time to add author details a different person in the lab wanted to be the first author. When I raised this, he was pretty angry and started arguing with me. First I calmed the situation down by opening a dialogue specifically about the project and contributions, rather than getting defensive or getting into ‘he said; she said’. We spoke about it for a while and he eventually calmed down, apologised and admitted he’d been under a lot of pressure recently which had affected his judgement. This is a classic example of the STAR (Situation, Task, Action, Result) interview technique, which has been addressed in much better pieces than I’m able to produce. But it’s also a great example of storytelling – you get context, time, cause, effect, and a solid conclusion. Any good story needs a solid point to kick off at. Whatever you’re working on, start wherever it makes sense to start and try to be as chronological as possible — if you find yourself jumping backwards in time to explain something, rethink your structure. In most cases, the protagonist will be you. Make sure to highlight what lessons you’ve learned and what knowledge you’ve gained. Show that as the story has progressed, you or your lab or science or your CV has grown as well. You don’t need to explain as much of your science in a weekly lab meeting as you’ll need to for an outsider. And you won’t need to dive as deep into your research at an outreach event as you might in a scientific paper. Build lots of versions of your story and find the one that fits your audience. There’s no point expecting anyone else to enjoy your story if you don’t like it yourself. Be proud of your achievements and accept and acknowledge your failures. A story is not a lecture. Make yourself open to conversation — put your work on preprint servers, share your email address far and wide, keep your website up to date, invite people to ask questions, be approachable. Engage with your audience and try to learn from them. Science is a collective endeavour. Your story should be too. Use any rhetorical technique you have in your arsenal to make sure people pay attention. Highlight your lowest points and highest points and make clear what was difficult and what was easy when appropriate. It might not be scientific to bring emotional discovery into a scientific story, but it will ensure that people pay attention. Nobody gets good overnight. The only way to improve is to keep working on telling a story again and again and again until you work out what people enjoy and engage with and what parts you can leave out. Start viewing your work in the form of a story, and you’ll very quickly get better at telling it. A story needs a good start point and it needs a good end point. One thematically pleasing option is to end at the present — ‘and now I’m here telling this story’ — but there are plenty of other options. Choose something with emotional significance that is likely to be memorable. Work out what story you want to tell; tell it; stop. Many thanks to our guest blogger Jack Leeming. Jack Leeming is an Editor at Nature Jobs.